The STI-091572 MICR monochrome laser printer is ideal for small, medium and even large workgroups. It delivers fast print speeds, flexible connectivity, and extensive input and output options to enable scalable solutions. The STI-091532-M35N MICR has an output of 35 pages per minute (ppm), and its 1200 x 1200 dots-per-inch (dpi) resolution provides crisp text and high-quality graphics. This is a low voltage model. Prints only standard MICR. Prints PCL, Postscript. The STI-091532 is a monochrome printer that supports up to A4/Letter-size media. It has an output of 35 pages per minute(ppm)(1) and comes in a network model only with 64 MB of memory, a 100-sheet auxiliary tray, one 250-sheet drawer, and a 10/100BaseTX Fast Ethernet port. Standard input capacity is 350 sheets and standard output capacity is 250 sheets. The STI-091532 has a maximum input capacity of 3,850 sheets and a maximum output capacity of 2,750 sheets. A number of media options can be installed to offer additional sources of input. Combinations of the 250-sheet drawer, the 500-sheet drawer, the 2000-sheet drawer, and multiple optional drawers are supported simultaneously. The 250-sheet duplex unit offers two-sided printing for the STI-091532. An Output Expander, High Capacity Output Stacker, and StapleSmart Finisher provide flexibility and a scalable solution in the future. The STI-091532 can adapt easily to existing infrastructures with the 802.11 Wireless feature and will use the optional wireless feature to reduce installation cost by avoiding the expense of Ethernet cabling. Add this printer with a wireless card to handle peak workloads, without waiting for IT to reconfigure cables. Preserve architecture or work around areas that are difficult or impossible to cable. The STI-091532 is provided with printer management utilities. MarkVision Professional is a cross-platform print management solution that enables IT administrators to proactively monitor and manage network devices in an enterprise environment via a Web browser. The STI-091532 controller features a 400 MHz processor. It comes with PostScript 3 and PCL 6 emulation, PDF v1.5 as standard data streams and a PPDS migration tool. The network model comes with 64 MB of memory soldered onboard and can support a maximum of 576 MB of memory. A 20+ GB hard disk with adapter feature is available. The network model comes with an IEEE 1284 Parallel interface with a type B connector, a Universal Serial Bus (USB), and a 10/100BaseTX interface as standard. The standard Fast Ethernet interface does not take up the network adapter slot. Optional wireless Ethernet is supported through the wired Ethernet port. The operator panel is a four-line 160 x 64 mm APA (all points addressable) display, supporting four lines with 20 characters per line. This provides easy navigation and usability is improved with simple to use, large, bold icons on the buttons. Reliability and serviceability are enhanced with "show me" screens and "tell me more" screens. -Simplex Letter 11.7 sec. 6.0 sec. -Duplex Letter 21.5 sec. 11.4 sec. -Duplex Legal 23.0 sec. 12.1 sec. The STI-091532 printable area is limited to within 4.2 mm (0.167 in.) of top, bottom, left or right edges of the media. Any information placed outside this specified printable area will not print. The printer comes standard with one 250-sheet paper drawer and a 100-sheet auxiliary tray. One 250-sheet output bin is standard. See table below for standard and maximum media capacities. Note: (2) Maximum of one Staplesmart Finisher and one Output Expander can be installed. The Staplesmart Finisher and High-Capacity Output Stacker are mutually exclusive. Note: (3) Maximum of one High-Capacity Output Stacker and one Output Expander can be installed. Note: (5) Not supported on STI-091532. Transparencies specifically designed for xerographic copy machines or laser printers may be used with the STI-091532. STI-091532 is compatible with applications running under the following operating systems for either local or network connections: For information about USB connections, see Local Connections. 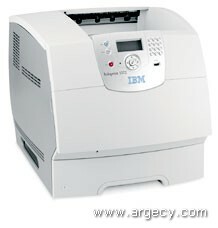 The software applications that operate with most Apple LaserWriter printers will generally operate with the STI-091532. The Macintosh 128, 512, and 512e Computers are not supported. MarkVision Professional and MarkVision Messenger are available via the Web at www.markvisionprofessional.com. NetPnP senses when a new IBM printer is attached to the network and automatically creates a shared printer object on the Windows NT 4.0 or Windows 2000 system. Furthermore, NetPnP notifies end-users via e-mail that the new network printer is available for printing. Designed for Windows NT 4.0 and Windows 2000 environments, Net PnP makes the STI-091532 printers available to end-users within seconds of network attachment. This option offers two-sided printing capability for the STI-091532 printer. The STI-091532 has one slot for memory DIMMs and two slots for flash memory cards and application solution cards. Only one flash memory card is allowed. This feature is installed in the internal network adapter slot. In addition to the standard USB port and standard parallel port, each STI-091532 model has one slot for an optional hard disk, optional internal print servers, or optional local connections. Network cards plug into the one internal interface adapter slot. Only one card is allowed per network protocol. That is, only one Ethernet and only one Token-Ring card. One Ethernet and one Token-Ring card are allowed. Any of the non base models have Ethernet onboard and cannot have a 10/100BaseTX card installed. These models can have the 10Base/2 card installed but it will disable the onboard Ethernet. The internal network adapters support and work in STI-091532 printer. STI-091532 complies with the global safety standard for Information Technology Equipment, i.e. IEC 60950, and its country equivalents in the markets we serve. The following sections highlight the approvals and certifications that STI-091532 is expected to receive. (R), (TM), * Trademark or registered trademark of International Business Machines Corporation. ** Company, product, or service name may be a trademark or service mark of others.Windows is a trademark of Microsoft Corporation.UNIX is a registered trademark in the United States and other countries licensed exclusively through X/Open Company Limited. IBM Corporation 2008.